Spray 6-quart slow cooker with cooking spray. In slow cooker, mix onions, chiles, garlic, taco seasoning mix, cumin, coriander and salt. Stir in broth. In 12-inch skillet, heat oil over medium-high heat. Cook beef roast in oil 10 to 13 minutes, turning once, until browned on both sides. Transfer to mixture in slow cooker; turn to coat. Cook on Low heat setting 8 hours. Transfer beef to cutting board; cool slightly. Shred beef, discarding any pieces of fat. Toss beef with 1/2 cup of the cooking liquid. Discard any remaining cooking liquid. Like it saucier? Toss beef with a little more of the braising liquid. 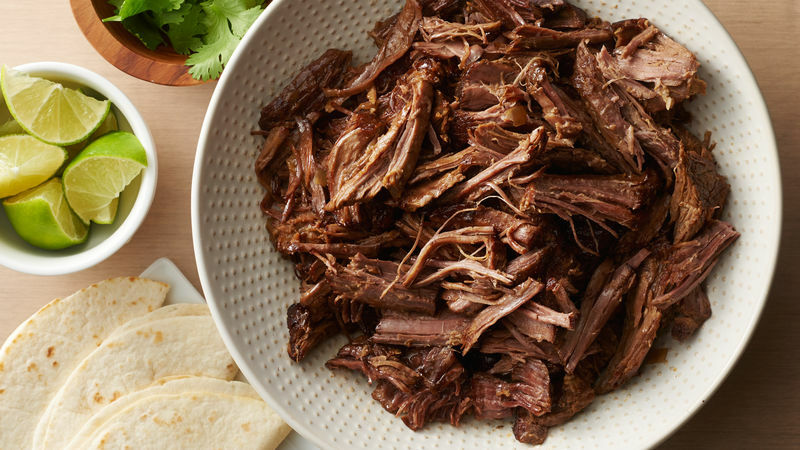 Make the barbacoa on Sunday, then use in tacos, tortas and bowls throughout the week.